Philadelphia is a major center of both professional and college sports. With all four of the “major” pro sports leagues, indoor and MLS soccer, indoor and outdoor lacrosse represented, in addition to four minor league baseball teams within 60 miles of campus and dozens of college teams on all levels, there are few metropolitan areas in the United States with as many opportunities for careers in sports than Philadelphia. As the size and scope of the industry grows, there is increasing demand for qualified people to serve on the business side of these organizations. The sports marketing major at Saint Joseph’s University is designed to create value for students by preparing them to succeed in careers in the global sports industry. 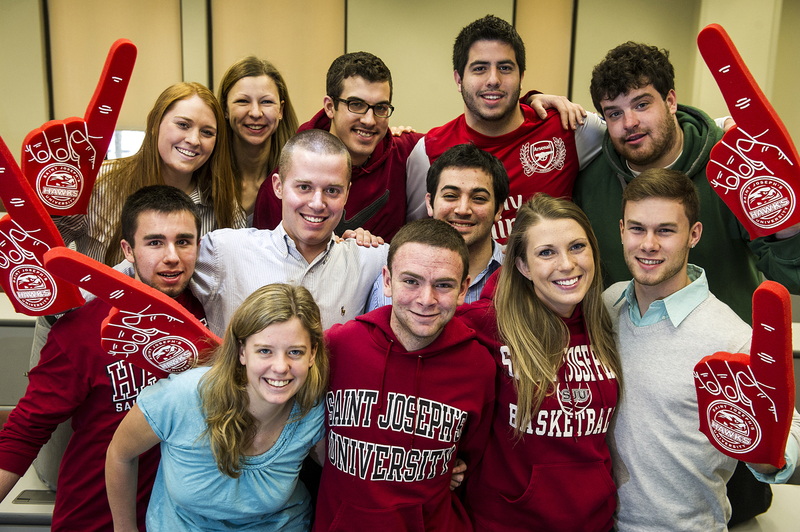 Sports Marketing at Saint Joseph’s is rooted in a strong liberal arts program which emphasizes values and ethics consistent with the University’s Catholic mission and the Ignatian tradition, and offered within the context of a strong general business education. We will impart knowledge, skills and experience that will create well-rounded graduates who can succeed in leadership positions in the today’s global sports industry. As the sports industry continues to expand, as measured by more leagues, teams and events; interest in fantasy leagues; many more media choices and a huge increase in programming; expanded front office staffs; etc., plus the increasing use of sports as a platform for promoting products by manufacturers of consumer goods, there is increasing and significant interest in sports business as a career choice.